Jeanne Larson remembers one of the first dates she had with her husband, Bill, a world-renowned mineral and gemstone expert. 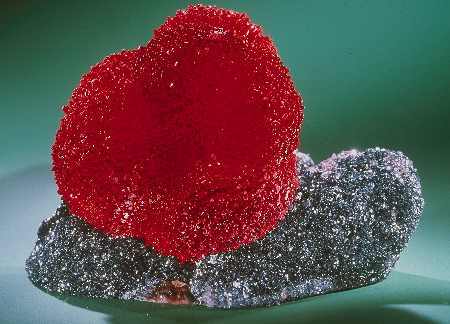 It was summer in San Diego and mid-winter in South Africa, where they’d flown in search of a rare rhodochrosite specimen, a fiery orange-red crystal. Their journey was prompted by an excited, middle-of-the-night phone call from Bill’s man in Africa. The couple drove from Johannesburg to a small mining area just north of Kimberly, where the big diamond mines are located. It was late and accommodations were scarce. They ended up in a boarding house “that wasn’t really equipped for lots of company,” Jeanne recalls. “It probably got below 42 degrees that night.” The only room available contained two narrow Army cots with a single blanket each—and no heater. There was, however, a communal bathroom down the hall with an old-fashioned tub that was nine feet long. “It was humongous,” Jeanne says, “a footed, pedestal type made of cast iron.” They did what any resourceful couple would: They filled the tub with the hottest water they could get, popped open a bottle of fine South African white wine Bill had rounded up, and stayed there until the water turned cold. The next day, their misery was rewarded with a now-famous, snail-shaped rhodochrosite specimen that has been featured in its full, rosy glory in numerous scholarly mineralogy journals. It’s one of Jeanne’s favorite pieces in Bill’s spectacular collection. The next day, their misery was rewarded with a now-famous, snail-shaped rhodochrosite specimen that has been featured in its full, rosy glory in numerous scholarly mineralogy journals. When the two met in 1977, the La Jolla native had no idea how complicated her life would soon become. She went to a party at Bill’s home on a tip from a friend who thought Bill might be interested in buying some La Jolla real estate from Jeanne. “I walked in the door, I didn’t know who he was, and I looked at him and thought, ‘Hmmmm, now this is a person I have to know,’” she says. The feeling was mutual, and after a bit of time spent reassuring themselves this was the real thing (both had been married before), they embarked on a planet-spanning, business-and-family relationship. Since he was eight years old, Bill says, he has been a fanatic about digging in the earth for mineral specimens. He met Josephine (‘Josie’) Scripps, San Diego County’s premier mineral collector, soon after he moved to Fallbrook from Minnesota with his family. She guided the young enthusiast into his present career. By the time he was 13, he had graduated from trading small tourmalines scrounged from local mining dumps to setting off dynamite for more serious treasure hunting. Scripps, already his mentor, became his business partner. Bill barely took time to earn a degree in geological engineering—and a Phi Beta Kappa key—from the Colorado School of Mines and to serve in the Army. After a stint searching for Alaskan oil, he hurried back to San Diego to the hard-rock mining he really loves. By the time he was 13, Bill Larson had graduated from trading small tourmalines scrounged from local mining dumps to setting off dynamite for more serious treasure hunting. Larson not only collects, trades and mines fabulous mineral specimens from around the world, but his finds and acquisitions are represented in more museums and publications world-wide than he can count. He’s supplied many specimens to the Smithsonian Institution alone. The Larsons own Pala International, a mining, trading, lapidary, and jewelry-design and sales organization that has operated mines on three continents—including San Diego County’s most famous and productive tourmaline mine, the “Himalaya” in Mesa Grande. Their retail shops in Aviara (Carlsbad; closed since the puplication of this story) and Fallbrook, appropriately named The Collector, draw visitors from many countries to ogle the museum-like displays. Both stores are in beautiful, natural settings (the Fallbrook shop is not far from the Larson’s hilltop home). Inside, specimens of raw crystal formations blend artfully with finished jewelry, often designed by Jeanne. The rainbow arrangements feature colored gemstones such as sapphires, tsavorites, and San Diego’s famous pink-and-green watermelon tourmaline. This is Jeanne’s lair now, and it was her business background and artistic bent that really put The Collector on the map for mineral and gemstone fans. Keeping up with Bill is not easy, but Jeanne, Director of Retail Sales for The Collector and corporate secretary of Pala International, is not exactly an idler. When she studied international business and languages at Georgetown University, she thought she’d end up in the diplomatic corps. Instead, she met Bill and acquired a globe-trotting lifestyle that has taken her into remote areas where water buffalo rub against the tents at night and the ever-present danger of theft keeps the senses alert as rough gemstones change hands late at night to avoid undesirable attention. 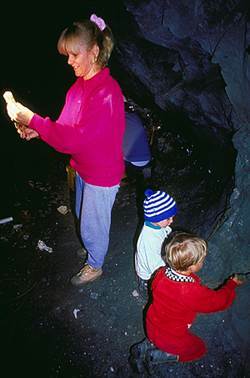 Anyone who has visited the Himalaya mine to watch the ancient pink crystals emerge from wet, sparkling purple lepidolite begins to understand. “It’s something that gets inside you,” Bill says of his passion for crystal collecting. With friends all over the world who share their passion, their adventures and their stories, the process of buying, selling, trading, faceting or storing crystals takes on the added dimension of human interaction. Point to any one of the extraordinary minerals and artifacts on display in the Larson’s home, and a fascinating story is sure to unravel. African art collected on their travels lends a touch of exotica to their rambling, one-story home. Delicate bird and fish paintings scattered throughout the house were done by Gamini Ratnavira, a friend the Larsons helped to relocate from Sri Lanka to Fallbrook; the stained-glass windows on the wine cellar are the work of another collector friend. In addition to minerals, Bill also collects wines, and Jeanne says it’s much easier now that they’ve added a real wine cellar: “For years, we didn’t have a place to store them—we’d drink everything we bought!” Nearby, floor-to-ceiling glass shelves display Bill’s collection of antique lapidary tools, from diamond cutters to microscopes. 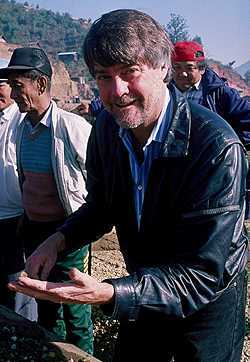 Bill, who serves on the board of the San Diego Natural History Museum, is well known to museum curators in dozens of countries and often lectures overseas. Recently, he’s been making contacts with the Soviets in high places, mineralogically speaking, and he’s excited about upcoming trips into the Eastern bloc, where capitalist trading ventures are just becoming possible. But with all the demands of travel and entertaining foreign visitors, both Jeanne and Bill insist on making time to spend home with the boys. They’ve organized and delegated the local business operations to make it work. In their book-and-artifact-lined media room, the press of a button brings down a large video-projection screen. It’s here, snuggled into a central, family-sized “playpen,” that the four gather each evening for quality video-watching time. They’ve collected so many memories an stories from their lovely business—tsavorite garnets swapped for tree gum in the mails, airline security agents snapping off $2,000 crystal specimens, journeys into remote areas where a local contact poses as buyer to keep prices down, screaming monkeys, and terrific Thai surf. Jeanne, eight months pregnant with Carl, made him promise never to go to that war-torn—but sapphire-rich—country again. He promised—and he hasn’t. Six times into the People’s Republic of China, 20 times to Bangkok, more than 20 trips to Hong Kong, 39 to Africa, 20 previous trips to Sri Lanka… but no, never again to Sri Lanka.